Free Woman Enjoying Freedom Feeling at Beach at Sunset. Slow Motion. Happy young girl enjoying freedom with open hands on sea. Cheering girl hiker open arms at sunset seaside beach. 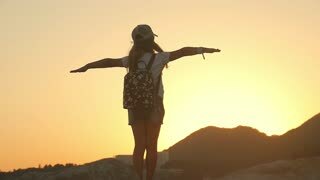 Young beautiful happy woman running with arms open along incredible golden sunset ocean beach enjoying freedom moments. 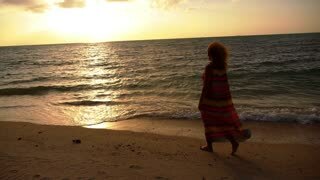 Beautiful happy middle aged woman walks and runs along epic golden sunset sea beach smiling at camera enjoying freedom.